I was recently on a coaching call helping a fellow motivational speaker, William Reed beefing up the amount of humor he uses in his keynote speeches. What made it fun is that we did it via video conference.But what made it REALLY fun was that for a moment, the technology glitched and the video just stalled. 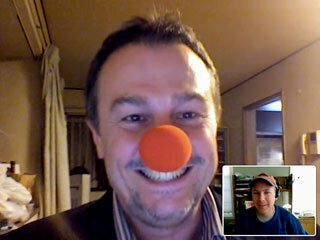 So we “hung up” and then restarted the video conference he came back on my screen wearing a clown nose. It was so sudden, so unexpected and so wacky that it just cracked me up. Funny? You betcha! Could you use this humor techniquein a business meeting, on a web cast, on a…you name it? Sure! That’s my point: it was so easy for him to do, took just a couple of seconds, and got a HUGE reaction from his audience. From me. Looking for an easy way to “break things up” or add a bit of humor to your workplace (or home?) Find a simple way to use a simple prop like my friend William. Brilliant – I love it! Just goes to show that props can be simple, easy to use and effective! The don’t need to be complex.